I just updated a Squidoo lens that I have had for a very long time and I got locked out of it because I had too many "nofollow backlinks" or something like that coming into the site. You're kidding. That lens was so old I have no idea where they all came from. I've started a new site and am working on a backlink strategy for that. I don't know what to do now! The situation I had over at Squidoo that caused me to delete my very old, very helpful lens got me thinking. I am assuming that traditional article marketing is still viable. Is this true? I wonder if Squidoo is a reflection of how the times have changed or if they are just being paranoid. Any thoughts? It's a squidoo thing. They are trying to become specialists at penalizing stuff that doesn't matter. I wrote a blogpost about this, but basically I'm going to start moving away from Squidoo. Well, article marketing is still valuable if you use high pr and quality article directories and you post fresh content there regularly, of course it is going to help you, I would say. Backlink strategies always change a bit, but the fundamental rules will always be the same, which is: High PR site is better than PR N/A (grey), but a high PR site means squat if it's not relevant to the page you're linking to. Another thing to consider is OBL, which is your external links count, the less the better. You don't want to link to your site from a site that has 1000 outgoing links, that's worthless. Oh, and before I forget, no matter who says what: AVOID .gov and .edu links like the plague, UNLESS you have a site that's highly relevant to the .edu or .gov site (which is pretty damn rare, if not non-existent for most). Nothing shouts "black hat" louder than a bunch of these links. If you want the upper hand over your competitors, here's your chance. SEO, SMM, Google Local Optimization & Professional Internet Marketing done-for-you. Never worry about Traffic & Lead Generation again! Click Here for more info. I was more or less agreeing with you until this. 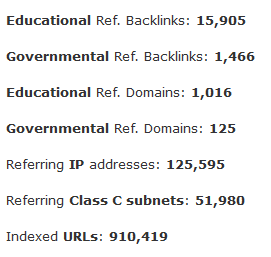 Lots of .edu and .gov site links look spammy? Relevance is really, really important. I get that. But to say that you should AVOID .edu and .gov links if your site isn't about education is terrible advice. Let's look at an example, shall we? Mashable.com is a site about social media and IM. Nowhere on their site to do they have a category remotely related to education. They must be doing some blackhat stuff, right? I really appreciate your thoughts on this, thank you for stopping in. What frustrated me is the lens was so old, I am sure I stopped having control over who linked to it long ago, yet I am the one who suffered? People were likely sharing it because they thought it was helpful. Why the bleep do they (squidoo) care? It's nice to hear that this isn't wholly indicative of an internet wide trend and that the basic tactics still hold. It's definitely not personal. There were lots of people creating lenses and them spamming them to death. It wasn't good for their site as a whole so they had to do something or die. I find that incidents like these help me refocus. Now that Squidoo's out of the picture you can spend your time building an awesome brand. Clearly these new policies from Squidoo are insane. They're running scared from Google. This is the main reason everyone always advocates getting your own domain and hosting. Then, you get to set the rules. Logo Design! Worth For Your Business Or Not?